As the old adage goes, 'the family that hacks 'n' slashes together, stays together'. That's good news for the Bergsons—the leading family of dungeon crawling adventure Children of Morta. As the guardians of Mount Morta, they've got an evil corruption to rid the world of. And, as the stars of a pixelated roguelike on Kickstarter, they've got a series of gifs to be adorable in. Each Bergson has a different set of skills, and a distinct main story that plays out through the procedurally generated levels. In addition, the story is augmented by random events—ensuring variety in each family member's tale. It's certainly a beautiful looking thing, quite apart from the robust-sounding RPG and adventuring systems detailed over at the game's Kickstarter page. Children of Morta is asking for $65,000, and has currently raised slightly over a third of that goal with 28 days still remaining. If you're interested in backing, you can secure a digital copy of the game with a $15 pledge. 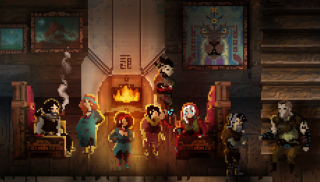 Children of Morta is planned for release in late-2015.